The Confidential has been having some fun with league-wide coaches Mount Rushmores. Football and Basketball, plus polls for each of football and basketball to share your thoughts. In fact, it was so sufficiently fun and controversial that we are going to do school-wide Mount Rushmores now. And we will only put three people on the list, leaving you–our readers–to comment as to who should be the fourth. We will not do polls anymore. For today, let’s go with a school that is still one year away from formally joining the ACC: Louisville. Last Thursday Ohio State President E Gordon Gee comments from a December school meeting spread across the media like a ragging wildfire. He said that the “damn Catholics” at Notre Dame couldn’t be trusted and questioned the academic integrity of the SEC and the University of Louisville among other absurd comments. He since has apologized for his comments at the request of OSU. In a March 2011 letter to Gee the OSU trustees laid out several steps for him to take and warned any further incidents could result in his dismissal. In a school email yesterday, Gee announced that he will retire on July 1. According to the Columbus Dispatch, Gee discussed his future with his family while on a Disney Cruise. He said his retirement wasn’t just about his comments. “I have apologized for those remarks and feel incredibly sorry, but I have moved on” he told reporters during a phone interview . He added that he is “quirky as hell” and that he doesn’t do things like most people. Rick Pitino gets his tattoo! After the Louisville Cardinals last loss of the season, a 5 overtime heartbreaker to Notre Dame, he demanded that they win their last 7 regular season games, the BE tourney and the National Championship. They agreed if he would get a tattoo. They lived up to their end of the deal and so now has head coach Rick Pitino. Pictures of the tattoo were tweeted out yesterday. It is on his left back shoulder and features a prominent Louisville L with 2013 running down the left side with NCAA Champions 35-5 written below it. The ‘L’ is about wallet size. Pictures in links below. Russ Smith has made his decision to come back for his senior season at Louisville official this past Wednesday. With Kevin Ware and Smith this will give the Cards a nice mix of youth and experience at the guard positions. If any doubt still existed as to whether the University of Louisville was the right choice for membership into the Atlantic Coast Conference, those doubts were dashed on Saturday, March 16, 2013. As I watched my beloved Cardinals struggle, persevere and then triumph against the Syracuse Orange in the last Big East Championship title game of the modern era, I couldn’t help but think about all the naysayers and detractors of Belknap’s athletic department as the ACC made its decision in 2012. Louisville basketball has come a long way, to be sure. We were always the known unknown who entered and left conferences. From the Metro Conference to Conference USA to the Big East Conference, the pride of Louisville proved and proved and proved themselves to fans, outsiders and future conference brass by winning national titles and battling our way into Final Fours. When Rick Pitino was hired as head coach after legend Denny Crum wrapped up his career, fans instantly knew the future was bright and we would give our new coach as much time as he needed. What we have accomplished as members of the Big East is still unfathomable in my eyes. I’m sure the Villanovas and Syracuses and Georgetowns and Connecticuts chided the decision to add us and others to their ranks and assumed they would continue to dominate the league. No one could have written the memorable storyline the Cardinals have produced since 2005. 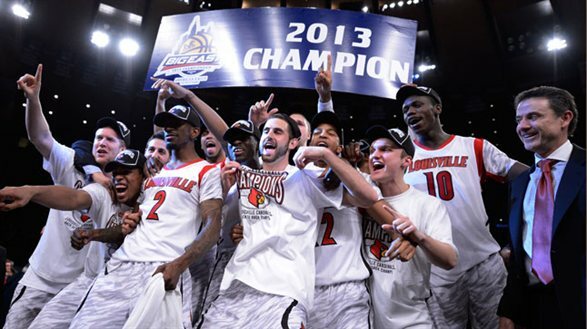 Louisville became the winningest program since the realignment of 2005 and has now won its third conference basketball championship. As finalists of the tournament in four of the last five years, the Cardinals have continued to prove their worth on the hardwood. In football, Louisville has always faced an uphill challenge. Scheduling juggernauts like Alabama, Georgia and Notre Dame had been a difficult feat to claim, and recruiting the best players from around the country has never been our trademark. However, the football Cardinals made it their mission to always be satisfied with the progression of the program and to constantly improve from within. Having won our two Bowl Championship Series matchups (2006 FedEx Orange Bowl and 2013 Allstate Sugar Bowl), we put everything on the field when we are placed on the stage and told to perform. 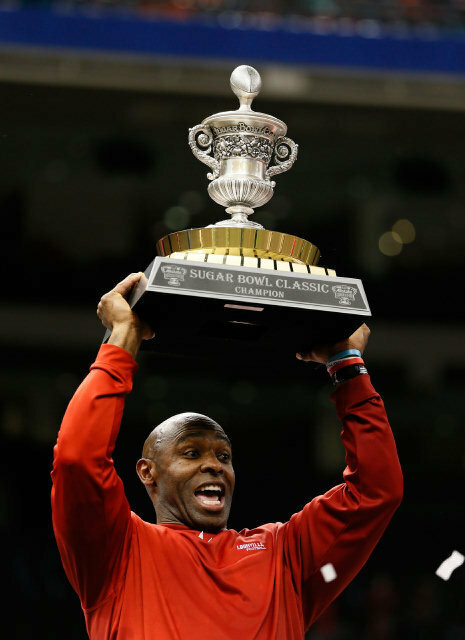 When Coach Charlie Strong chose to extend his contract at Louisville rather than take the Tennessee job with the Southeastern Conference, fans surrounding the university knew what he thought about his current job and the institution. The sigh of relief throughout the River City came from fans who realized that our time had finally come to keep our coach and strive to maintain and surpass our accomplishments. Although elevated, it is clear head coach Charlie Strong is not satisfied with the heights of the program under his tutelage. The invitation to the ACC combined with the fashion in which Louisville dealt the Gators the loss in the Sugar Bowl sent the city into overdrive. All we ask is for a chance to prove our worth. That is all we have ever wanted, and it appears we will soon get our chance once again in the prestigious ACC in 2014.